Cameroon’s head coach, Volker Finke, has named 28 players in his provisional squad for the World Cup to take place in Brazil in June, the Cameroon Football Federation (FECAFOOT) said on Monday. 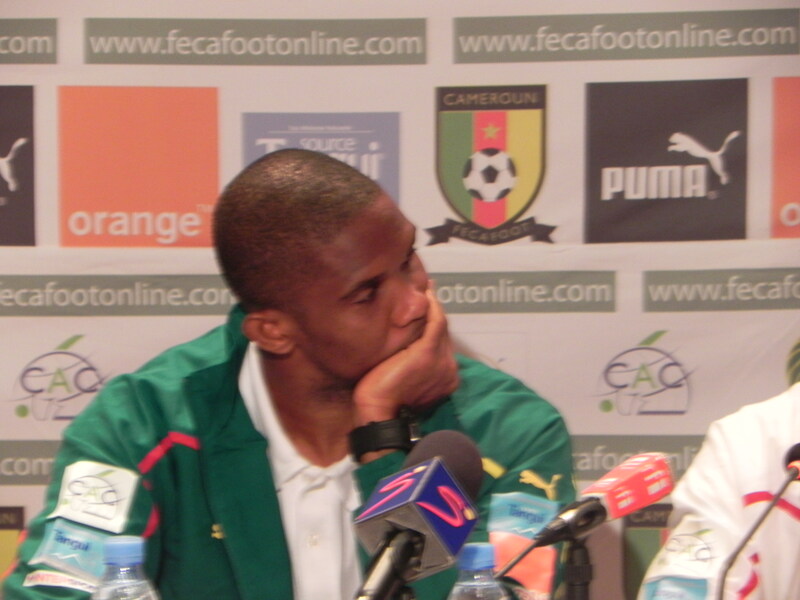 Apart from the inclusion of two players – Loic Feudjou and Cédric Djeugoue – who ply their trade in Cameroon’s top league, there are few surprises in the squad, which includes 16 players who were at the 2010 World Cup in South Africa. Youngsters Edgar Salli and Fabrice Olinga who have been on the fringes of the squad have a chance to show their worth before the final cast of 23 is named. There is no space for veteran goalkeeper Idriss Carlos Kameni and England based defender Sebastien Bassong. Cameroon defeated Guinea Bissau 1-0 in Yaounde to sneak into the final round of qualifiers for next year’s Africa Cup of Nations (AFCON) in South Africa. The Indomitable Lions were held on their own turf for 81 minutes by a resilient Guinea Bissau side until forward Benjamin Moukandjo beat goalkeeper Jonas Mendes following a cross from the left flank by substitute Yannick Ndjeng. “They played with eight players in the defence and it was difficult for us,” said Martin Ndtoungou Mpile, Cameroon’s deputy head coach. “But at the end we won,” Ndtoungou added in a post-match interview with Cameroon’s State-run TV (CRTV). While the coaches and the players were visibly satisfied with the result, pundits on TV and Cameroonians reacting on internet forums have expressed disgust at the quality of play served by the Lions. The team had the ball possession and made endless passes in midfield and outside the Guinea Bissau penalty area but lacked penetration. The final ball was poor and the finishing from some of the players was near abysmal. The few fans who had turned up to watch the Lions at the Ahmadou Ahidjo stadium were so disgusted with some of the misses that they spent their time chanting the name of “Eto’o,” the suspended skipper of the national team. 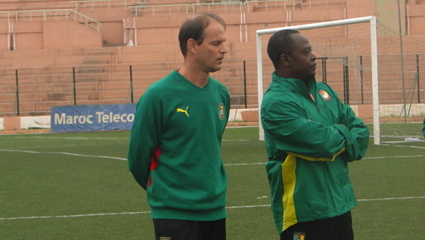 Head coach Denis Lavagne would surely point to the fact that Cameroon played higher up the field than in any other game under his tenure but critics would argue that this was against a weak Bissau team that had come to defend and left the ball to the Lions (who visibly didn’t know what to do with it). Pundits remarked that the team still couldn’t find a working link between midfield and attack with Alexandre Song, who had to play that role, missing in action for much of the game. Some of his best through balls were made when he was playing from a deeper position than that of the anchor behind the strikers. Henri Bedimo, the left-back made a number pf overlapping runs and some crosses in what seemed the only other means of outwitting the Bissau side. Georges Mandjeck, the midfielder who plays as right full-back under Lavagne, made a few forward runs as well but nothing really happened until the coach substituted the big centre-forward, Leonard Kweuke. Ndjeng, who replaced Kweuke, was more mobile – dropping deep and making runs across the area – to drag the opposing defenders out of position. He was assisted in this by Vincent Aboubakar who (controversially) replaced Eric-Maxim Choupo-Moting, the team’s current goal-poacher. Aboubakar dribbled and took the game into the opposing area but his finishing was sub-standard mainly due to his over-exuberance. There was relief for the Lions when Ndjeng centred from the left for Moukandjo to score after what seemed on television like the ball had touched the Nancy striker’s hand. Cameroon go through on a 2-0 aggregate since they had also defeated Guinea Bissau 1-0 in the away leg game played in Bissau last February. 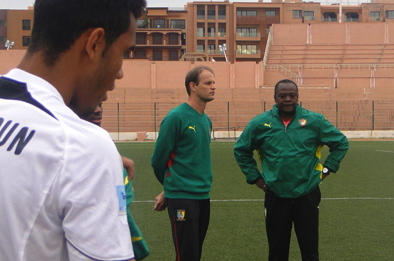 It was Lavagne’s third 1-0 victory in four competitive outings as Cameroon coach. He has only lost one game (2-1 to Libya) since taking over in October/November 2011. But the near empty stands were very telling about what Cameroonian fans think of their national squad these days. NB: Cameroon’s starting line-up [playing 4-3-3]. -William Overtoom in for Moukandjo. English pundits have been full of praise for Cameroon’s Alex Song for his commanding performance in midfield when Arsenal beat Manchester City 1-0 in a crunch English Premier League duel on Sunday. Victory takes Arsenal to third in the league, two points clear of Benoit Assou-Ekotto’s Tottenham Hotspur. If Arsenal hold on to that spot, they’d automatically qualify for the UEFA Champions League. However, the contest between the London rivals that feature two of Cameroon’s best acts of the European season (Song and Assou-Ekotto), still has some way to go with six games left. Read David Pleat’s full match analysis here. It was late. Barely two minutes to the end of regular playtime in a drab game between Cameroon and Guinea Bissau. The young Eric-Maxim Choupo Moting, tired of hugging the touchline waiting for passes that never came, decided to take things into his hands. He drifted into the centre of the park, collected a loose ball and drove straight into the opposition area. A quick touch took away three defenders, he raced and hit the ball. A low drive that bumped on the synthetic turf and beat the Guinea Bissau keeper. 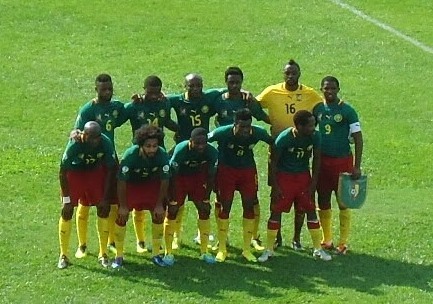 1-0 for Cameroon and a winning start to their quest to qualify for the 2013 Africa Cup of Nations to hold in South Africa. You could see relief on the faces of the Cameroon coaching staff including – the Team Manager (logistics officer) Rigobert Song who at times barked more orders than the manager Denis Lavagne. The Indomitable Lions had shown very little creativity in the previous 88 minutes. If that surprised anyone, it shouldn’t be readers of this blog. A reading of the 22 that the coach picked for this trip had exposed the dearth in creativity (read our previous post here) facing Cameroon. Too many defensive players, hardly any creators. It was so glaring in Bissau as Lavagne’s 4-3-3 failed to click. Lavagne had gone for a back four of – Allan Nyom (RB) -Nicolas Nkoulou (CB), Aurelien Chedjou (CB) – Henri Bedimo (LB). The midfield three included Joel Matip sitting deep in-front of the back four , while Alexandre Song and Landry Ngeumo played as shuttlers/organisers with the job of linking up with the attackers – Choupo Moting (R) – Vincent Aboubakar (C) and Jacques Zoua (R). Song and Nguemo tried to engineer movement by making forward runs and passes but these (admittedly gifted) players found it hard to switch from the defensive roles they usually play for their clubs to become clairvoyant playmakers. This left a complete disconnect between the lines. Unable to move the ball forward from the back and handicapped by the plastic turf that gave a funny bounce to the ball, Cameroon reverted to playing long-balls forward. It wasn’t easy on the eye. There were a handful of chances but nothing to whet any observers apetite. Lavagne could argue that the team had only a day to train. That is true. He could also argue that the squad is very young. That is also correct. He could also say that it isn’t his fault that Cameroon doesn’t really produce many creative players. That is also understood. But he needed to have thought through this game properly because all of those excuses were known long before the team travelled. He showed poor decision-making when he opted to field Choupo-Moting – the only player with a measure of creativity, passing skill and scoring ability – on the right flank. He could have actually gone 4-2-3-1 and played Choupo-Moting behind the main striker as Javier Clemente had realised. Yet another option could have been to use a diamond formation with the same players though Aboubakar and Zoua would have functioned as a strike partnership and Choupo-Moting as a playmaker behind them. It is only when Choupo-Moting dropped deep and played in the hole behind the forwards that Cameroon managed to look interesting. But that was rare. Fortunately for them, the Mainz player scored on one of those occasions. But some of the young players were a let down. Was it the heat? Was it the fact that it was the first time all were playing together in a starting line-up? Whatever the case, Vincent Aboubakar, still has some way to go to become the finished product to spearhead Cameroon’s attack. He still has problems in his movement without the ball. He needs to improve his tactical awareness (making good runs or anticipating passes). There were several times in the second half when Song conjured up some defence splitting through-balls but Aboubakar was always off the mark. There was a close-up shot of Song shaking his head in despair at the 63rd minute after one of such missed opportunities. Jacques Zoua, who made a beautiful assist for his club FC Basle against Bayern Munich, struggled on the right flank. And when he had a glorious opportunity at the 60th minute , one-on-one with the goalkeeper to head home the curtain raiser, he wasted it with a tame effort. Edgar Sali came in for Aboubakar at the 61st minute while Leonard Kweukeu replaced Zoua four minutes later. The substitutes didn’t create much, though. However, these are all young players who have the potential to become great with the right coaching and context. They could learn a lot from a player like Samuel Eto’o if and when he ever returns to the den. For now, the youngsters and their coach can thank Choupo-Moting for saving them from the wrath of a demanding fan base. Cameroonians know their team is not at its best these days but they would have found it hard to accept a 0-0 draw with the team ranked 166th in the world (i.e. 100 places below Cameroon ranked 66th). Cameroon’s national soccer team captain, Samuel Eto’o has been handed a fifteen match ban for inciting his teammates to revolt against how the team is managed. The players refused to travel to Algeria for a friendly game, in what the Anzhi striker described as a protest action along the lines of the “Arab Spring” revolutions that led to the fall of the Presidents of Tunisia and Egypt, the Cameroon Football Federation (Fecafoot) said in a statement on Friday. From the statement issued by the disciplinary council, it appears that the players, under the leadership of their captain, had made other demands which they wanted to be met. – That the rate of match bonuses be reviewed (increased) ahead of the 2013 Africa Cup and 2014 Wold Cup that start next year. “The players may have been right in their demands but their style and manner of seeking redress was bad,” a Senior Official in the Federation told me. He also felt Eto’o and vice-captain Enoh Eyong Takang – who has been banned for two games – had slighted authorities and had to have their wings clipped. The statement following the disciplinary hearing says Eto’o described the vice-President of Fecafoot as “Papa menteur” (a lying old man). Apparently, Eto’o and Eyong are being punished for protesting. These are players and their role (in the words of the official who spoke to me) is to obey orders like soldiers. The fact that the Federation and the Ministry of Sport did not agree on who was to pay the said appearance fees (an aspect that transpires in the disciplinary council’s statement) has been conveniently brushed aside. Authorities have argued that the money finally came on the eve of the match and that the Algerians were ready to pay. But does that absolve them from accusations of incompetence? If it was possible to get FCFA 15 million on the eve of the game after the players threatened to boycott the game in Algeria – why had the authorities not done so earlier? Didn’t the players make present their demands at the start of the camp in Morocco? Why, even for courtesy sake, were the players not told before that they were going to play in Algeria for free? And was it normal – for Cameroon’s image – that Algerians be called upon to pay fees which should be the duty of Cameroonian authorities? Refusing to play a game is certainly reprehensible. In addition, some of the players’ demands (mentioned above) seem a stretch too far. However, not all the persons responsible for the fiasco have been judged or punished. Federation officials who spent their time warning and threatening the players, are the same people who wrote reports used against the players, and are the same people who appeared as witnesses to testify against the players. What does that say about fairness and justice? Apparently, Eto’o picked the wrong crowd to start an “Arab Spring” uprising against. He has 10 days to appeal the verdict of the disciplinary council. However, if his 15 match ban is upheld it would mean the end to his international career. It isn’t a secret that many would love to see him gone, though. He has often been criticised for an overbearing grip on the team, staff and officials. Such a ban would also send a warning to any potential dissidents in the ranks of the Indomitable Lions. However, it leaves a rather wealthy and popular loose cannon, who knows enough to rock the federation’s stable. This may come to haunt those who took the decision in the long run.